You can buy food grade Propylene Glycol (PG) locally in some specialty craft stores (in the baking section), as well as farm supply stores (e.g. Tractor Supply) for use as a livestock health supplement. As always, make sure you are purchasing the correct product and that it’s certified as food grade or meets U.S.P. purity requirements. If you don’t need it right away, purchasing Propylene Glycol online is probably your best option. It can be found in a variety of quantities and purity ratings, including food and U.S.P. grades. Propylene glycol (PG) is a viscous and a colourless liquid that is soluble with water and alcohol. Containing two hydroxyl groups, it is classified as a diol. Its INS food additive number is E1520. Propylene glycol is often used in food products where a certain content of moisture is to be maintained, making it a popular humectant in the food industry. A humectant is a substance that has the property of keeping food moist, which is typically a result of various hydrophilic groups. PG can be used to absorb water, reducing the moisture content available for microbial growth and increasing shelf life. It is also used as an anti-caking agent and helps preventing lumps, which ultimately results in easier packaging and transport of a food material. It makes the substances free flowing, keeping them away from moisture by absorbing it itself. PG is also used as a glazing agent, which provides a substance a waxy glaze or shine on its surface. A good glazing agent should show homogenous results. Since it acts like a protective cover over particular food product, it also prevents moisture loss into the atmosphere naturally, increasing the keeping quality of food. Due to these properties, propylene glycol is used in a range of products including coffee-based drinks, liquid sweeteners, ice creams, and sodas. 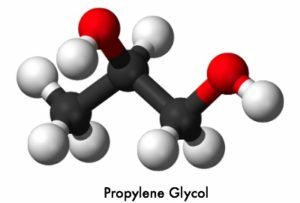 Propylene glycol is “generally recognized as safe” (GRAS) by the U.S. Food and Drug Administration, allowing it to be used as a food additive. Although generally safe to consume in the amounts typically used in food products, it can cause irritation when used in fog machines and the like. Be the first to comment on "Propylene Glycol"